Summer 1948. In the scenic, remote river town of Oregon, Illinois, a young couple visiting the local lovers’ lane is murdered. The shocking crime garners headlines from Portland, Maine, to Long Beach, California. But after a sweeping manhunt, no one is arrested and the violent deaths of Mary Jane Reed and Stanley Skridla fade into time’s indifference. Fast forward fifty years. Eccentric entrepreneur Michael Arians moves to Oregon, opens a roadhouse, gets elected mayor, and becomes obsessed with the crime. He comes up with a scandalous conspiracy theory and starts to believe that Mary Jane’s ghost is haunting his establishment. He also reaches out to the Chicago Tribune for help. Arians’s letter falls on the desk of general assignment reporter Ted Gregory. For the next thirteen years, while he ricochets from story to story and his newspaper is deconstructed around him, Gregory remains beguiled by the case of the teenaged telephone operator Mary Jane and twenty-eight-year-old Navy vet Stanley—and equally fascinated by Arians’s seemingly hopeless pursuit of whoever murdered them. Murder, obsession, a cover-up - just the kind of book that I used to love to read 30 years ago. I'm thinking Joseph Wambaugh, Vincent Bugliosi. I couldn't wait to get started on this one. Unfortunately, Gregory failed to deliver the kind of gripping story I was expecting. That may be partly my own fault and false expectations. I wanted more about the lives of Mary Jane Reed and Stanley Skridla; it would have made the solving of their murders as imperative to me as it was to Mike Arians and Ted Gregory. But the book is titled Mary Jane's Ghost for a reason and the reason is not, entirely, a supernatural one (although Arians spends decades convinced that Mary Jane's ghost does haunt the restaurant he owns). 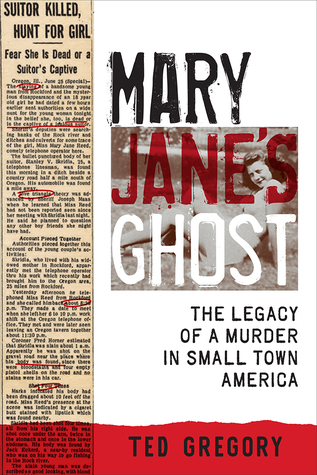 Rather, the book is about the way that Mary Jane's murder haunts these men, particularly Arians who spent more than $100,000 trying to solve the murders, agitates officials for decades, and gains a reputation as being a little bit crazy amongst the townspeople. If Gregory had stuck to that story, even, I think it would have been one that kept my attention. But by the time he came into the picture, and so many years after the murders, there were few people to interview and not a lot of evidence to examine. Perhaps there just wasn't enough to write a whole book about. So Gregory puts himself, and the stories he was writing for the Chicago Tribune during the more than a decade that he was involved with Arians, into the book. It begins to feel like a book about Ted Gregory and the stories he wrote for more than a decade, that happened to include, over and over again, the murders of Reed and Skridla and Arians quest to solve them. It's not that Gregory doesn't have an interesting story; he does. He was, after all, at one of the countries most respected newspapers at the time of the Great Recession and at the time that print media relinquished its reign at the source of hard-hitting news. It's a story worth telling; it just wasn't the story I was expecting. Still, at just over 200 pages, it's an interesting read. Readers will learn more than than they will ever want to know about what goes on when you exhume a body that's been in the ground for decades (hint: you'll be glad this is a book and not a documentary). And the other stories that Gregory takes about are all interesting to read about. I just wish there were more about Reed, perhaps pictures, so that I might have understood better how Arians became so obsessed by a girl who died years before he came to Oregon, Illinois. It sounds like an interesting book. Sorry it wasn't quite what you wanted. But it's pretty short so I may pick it up sometime. I am sorry this one wasn't what you were expecting. From the description, I likely would feel the same way you do.